It was administrative professional's week so I thought it was an opportune time to bring our department secretary out for a well deserved lunch. Watching her step out of office beaming in her best stilettos was enough reason to make my day. The swanky interiors of asia's highest brewery did not disappoint. We were ushered briskly to a table with a lovely window view of singapore's marina bay promenade with a birds eye view of marina bay sands. At only $33++ it's no wonder that this restaurant gets booked up v quickly especially for lunch. And indeed this has got to be one of the best value set lunches in Singapore. We started off experimenting with the extensive and innovative salad bar, which featured lovelies like hummus salad with rocket leaves and a delightful Tuna pasta. There was also smoked salmon, jammon ham, a variety of cheeses/breads and sweet chilled prawns. The restaurant seems to spare little expense on investing in quality produce. I indulged myself so much that i almost forgot to save space for the main course. Which would have been almost a crime. Given the location of the restaurant, it is not uncommon to see well heeled executives tottering into the restaurant with their fake accents and branded bags. Their porcelain faces soon break into genuine smiles as the main courses appear. 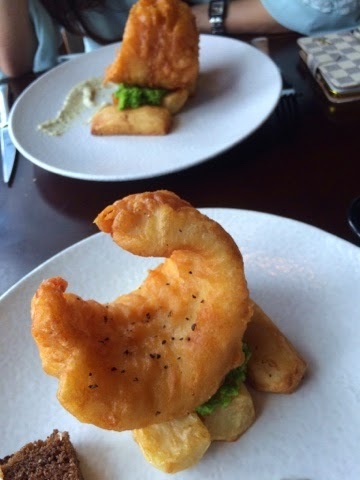 Fish and chips are the order of the day. Any extra calories can be burned off at the gym after work. I love the fish and chips here. Portion is generous, the batter is sufficiently thick yet crispy and the fish is fresh. Nothing much has changed about this dish since i first tried it many years back. It is just consistently good and perfectly executed. And yes, it still comes with a trademark bright green smudge of mashed peas and semi soggy potato wedges. Dessert is simple and no frills but delightful nonetheless. Help yourself to a small tray of cupcakes, eclaires, tiramisu or carrot cake placed non descriptly beside the salads. Tea is chargeable but would be a fitting end to the meal if u are planning to overstay and enjoy the view just a little longer. I should come back more often but i keep forgetting.